Rivers State Governor, Chief Nyesom Wike (left), swearing- in the Caretaker Committee Chairmen of seven local government areas at the Government House in Port Harcourt, last Friday. 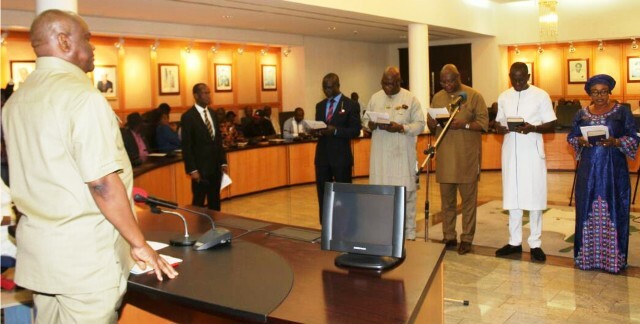 The Rivers State Governor, Chief Nyesom Wike has sworn-in five new Commissioners and seven Caretaker Committee Chairmen in the state. Those sworn in as Commissioners include Dr Fred Kpakol, who was former Commissioner for Finance; Prof. Roseline Sonayee Konya, former Commissioner for Environment; Rt. Hon Dumnamene Dekor, who was former House of Representatives member. Also sworn-in were Mrs Tonye Oniyide and Shedrack Chukwu. Wike during the swearing-in ceremony, last Friday in Government House, charged the commissioners to establish link with their constituents, stressing that they were appointed to render service to the state, especially their respective constituencies so that the people could benefit from programmes of the state government. “From time-to-time, brief your people on the programmes of government for the good of the state. Be committed to your work. If you do your work, you will get my support”, he advised, and stressed that if they lose touch with the people, government would have problem. Wike urged the new commissioners to give 100 per cent loyalty to his administration as he would not tolerate divided loyalty. In the same vein, seven caretaker committee (CTC) chairmen also took oath of office and oath of allegiance. They were Gogo Friday Isaiah (Andoni), Mr Waite Harry (Asari-Toru), Chief Godspower Nwoka (Emohua), Bishop Best (Ikwerre), Mrs Goodnews Ozioma Amadi (Obio/Akpor), Hon. Lawrence Alabla (Okrika) and Dr Tamunonimim (Opobo-Nkoro). He warned the new CTC chairmen not to compromise security and prompt payment of workers’ salaries in their various areas, stressing that any chairman who compromises with security would be sacked. “You must be close to the people; you must be available with security agencies to fight crime. Support your DPOs, SSS, etc. Don’t go to the councils only when allocations come”, he said. On the issue of reappointment, he strictly warned them against giving money to some persons hoping they would influence him to reappoint them for second term, and pointed out that the power to reappointment any chairman for second term remains exclusively with him, explaining that such depends on how well they serve the people and government. Responding on behalf of the appointees, Prof. Roseline Konya said she and her colleagues would redouble their commitment and effort to serve the state better.